The "Take It!" came from approaching vans that were already stopped at a traffic lights that were ahead of me in line waiting for the light to change. I did the usual pull up behind them giving safe distance between us and moved into my usual mind set of engaging in very random viewing of what was going on around me. I am in constant quest for different subjects that I may have either not seen before when passing the same location or better yet, something that is different or momentary. It is not my usual custom to look at the back window of vehicles that are in front of me, but for some reason the upper image caught my eye. I inched the car closer to get a better look at what was clearly a reflection off the glass of overhead clouds. The curvature of the glass gave the reflection an additional interesting and to me, quite pleasing dimension to this already wonderful display of nature. This was one of those times when I had to speed up the process of digging out my camera from my left front pants pocket while seated. I use a Canon G12 which is now getting a bit old having been updated by several models which are slimmer and include much more technology. So the maneuver game to fetch the camera while seated is a bit of a contortion which I usually avoid by standing up first, which decompresses the pocket somewhat, making retrieval easier. Time nor situation did not allow for the stand up - so it was a "quick quick for a click," which I was lucky enough to have accomplished before the traffic light changed to green and my subject was gone. 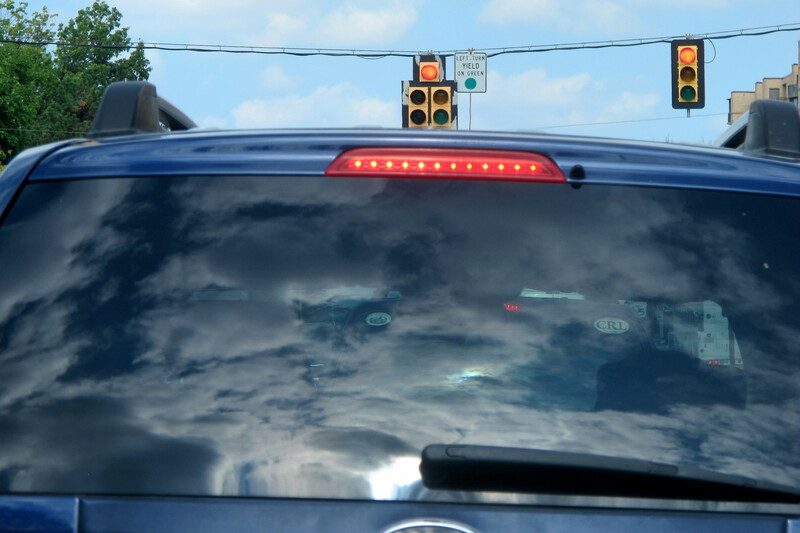 Having been successful in capturing the first back window cloud reflection, I was overjoyed and quite happy to be satisfied with it being an unusual and maybe "one time catch", when shortly thereafter at a subsequent stop light, yet another such image appeared on a different vehicle. Having had a recent rehearsal of the maneuver, I quickly put into play a repeat that was thankfully accomplished somewhat quicker, enabling me to take the second shot, which is displayed below. It seemed like I was afforded a lot less time to make this second capture. Traffic lights have differing times assigned to them and I think I was lucky enough to have gotten the first of the two lights with a longer holding setting. Had I not had the rehearsal I would not ever have been quick enough to have gotten the second. The After Take: Found everyone quite taken with the catches. The surprise of seeing such images in a stopped vehicle at an intersection found them asking how did I manage to see them. I responded by letting them know I joined them in the wonder of it, and that I consider these things as gifts that are offered to me by some source quite outside of me. I feel very fortunate to be the recipient of these offerings and even more so in that I am often able to catch them with my camera and thus share the bounty. 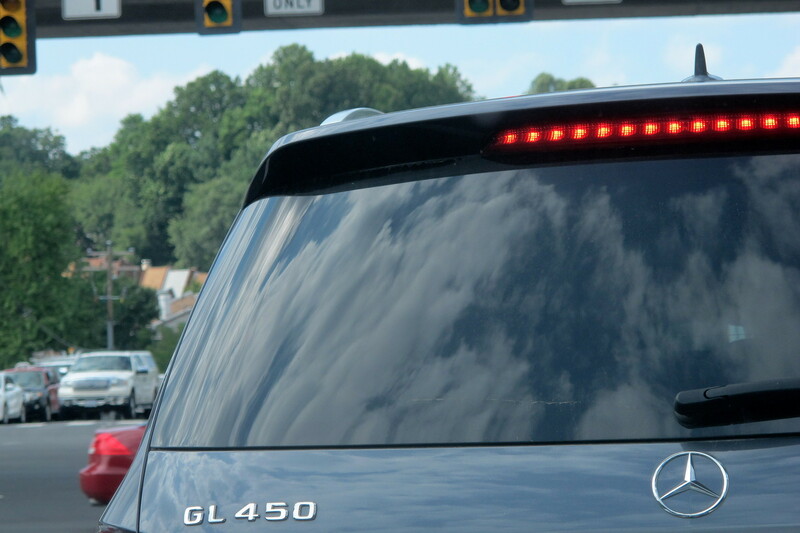 Here is hoping you are able to join me in taking a little different look at the rear window of that vehicle that is stopped in front of us in the future, for maybe there might be a reflection of a great cloud that has been enhanced even further by the curvature of the glass in the window. I wonder what the person driving the car was thinking haha. I wonder if they know about the canvas they have on the back of the car. What a fun catch. I have been noticing things like this since I've began to frequent this site. Your words and images encouraged me to keep my eyes open. My car has a full body decal on it for my work so I can only imagine what can be grabbed from mine. It's a rainbow and the sun on the back. Gabe, Amazing how many forms canvas takes on. Even more amazing is how many of these forms show themselves to us, and we do not see them. I am lucky when I catch one. Treehugger, despair not, for those stickers have meaning and convey that to others. Communication like yours is a treat to behold. Sf1967, Thanks for letting us know you are taking up a wider view. I hope it brings you many pleasures and you will find even more joy in passing them along to others. Thanks again for the high praise - it humbles me. Yuppie7, Lucky you. I just run around with a standard silver paint job, while you are a stand out. Congratulations.